Newly renovated with beautifully appointed rooms. Located in the heart of downtown Toronto with easy access from major highways, Gardiner Expressway and Don Valley Parkway. Close to several Toronto attractions such as Eatons Center,CN Tower, Dundas Square. 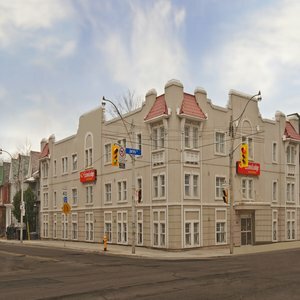 Also in close proximity to the National Ballet School of Canada, Canadian Opera Company, Four Seasons Centre, BMO Field, Edge Walk, Ricoh Stadium, Direct Energy Centre and Bell Lightbox Two level suites available. No onsite parking. Limited local parking available from 15.00 a day plus taxes. Pet Charge: 20.00 per night per pet. Limit 1 pet per room 10 lbs. and under. Refundable deposit 100.00 per stay for guests paying cash.